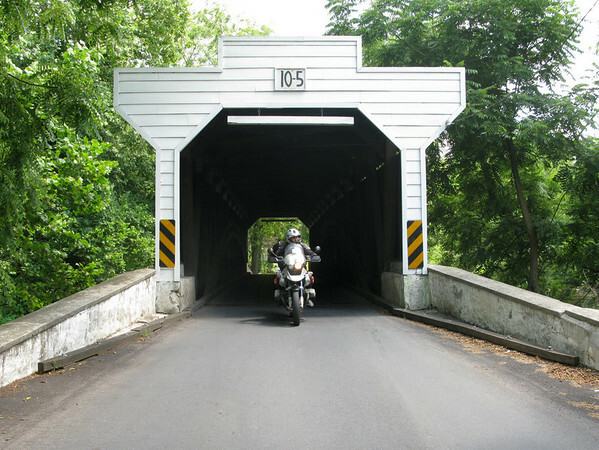 For thirty three years now, the Ramapo Motorcycle Club has hosted a road rally that is open to non-member participation called the Ramapo 500. 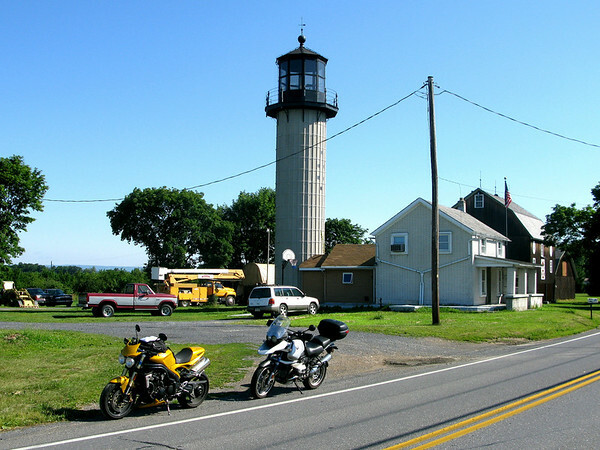 A motorcycle road tour consisting of two nearly 250 mile legs, the 500 takes riders through some of the lesser traveled byways across the New York tri-state area. This year, for the first time I was lucky enough to get one of the 400 spaces available for the ride. When Kenny and I rolled out of the garage at a little after 5:00am, like on most of our overnighters, we left in rain suits. I couldn’t let it get me down even though it is really becoming a running gag. On this day, I think Mother Nature was just reminding us who’s boss and to have a good time no matter what. Nearly 100 miles later as we exited the New York State Thruway in Suffern, NY where the clouds gave way to sunshine for the remainder of the next two days. Our rain suits went back into their bags and there they stayed. Being that we had missed the cutoff for pre-registration we arrived early for the 7am start. We wanted to be sure to 1) get a route sheet and 2) move out ahead of any large packs of slow moving motorcycles. Fortunately, we managed to do both. $45 bought us a route sheet, participation pin, camping at the designated campground, dinner and breakfast the next morning and finally if we returned to the tour starting point a patch to commemorate the ride. That was a pretty good deal in my eyes. 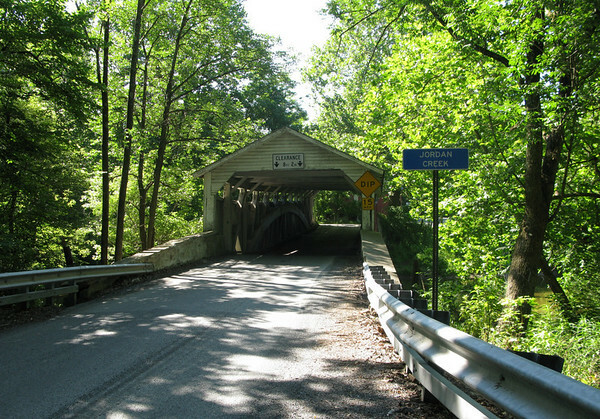 The theme of this years tour was Covered Bridges. 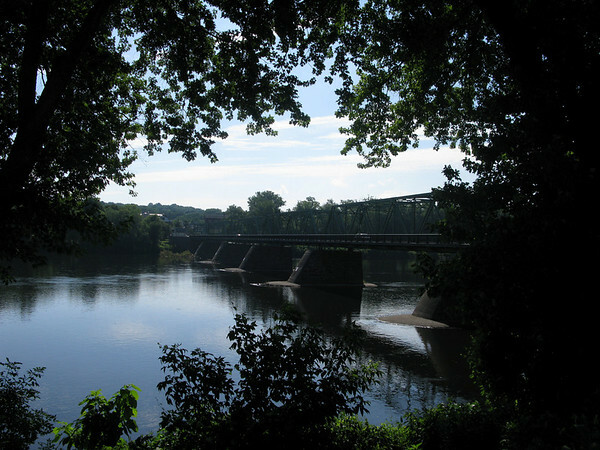 Our route had us leaving Suffern, NY traveling into nearby northern New Jersey and on into Pennsylvania for the majority of Saturday. 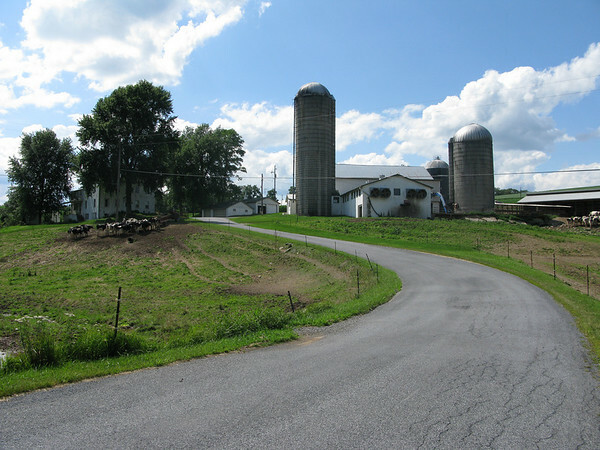 The completion of Saturday’s leg would put the group in to the Appalachian Campsites in Shartlesville, Pa. for the evening where festivities were to take place. Kenny and I were some of the earliest departing riders which meant that throughout the day we saw very few other participants out on the roadways or any other significant road traffic for that matter. I found myself riding along thinking that for the most part, we really had the roads to ourselves. 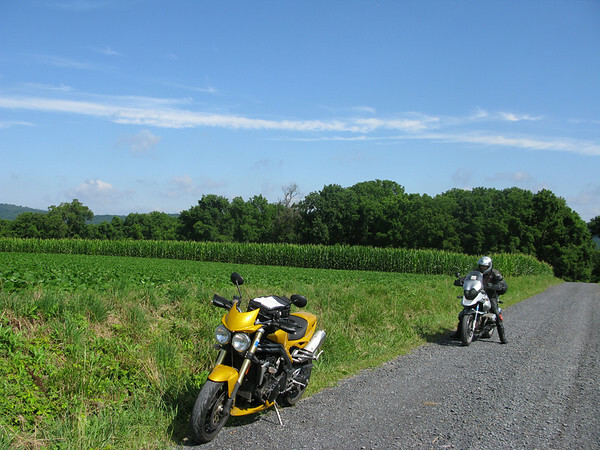 I don’t know how they did it but the crew at RMC put together a route that took 400 bikes through shady country lanes, over hill and dale, through gentle meandering farm roads all while seemingly keeping that throng of motorcycles all spread out. Bravo, Ramapo! 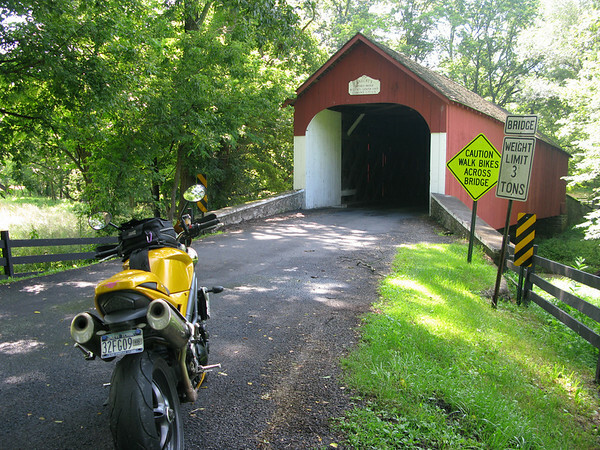 Over the course of the two day ride, we passed through 17 charming covered bridges of varying age and size. The mostly red spans where spread out through eastern Pennsylvania. 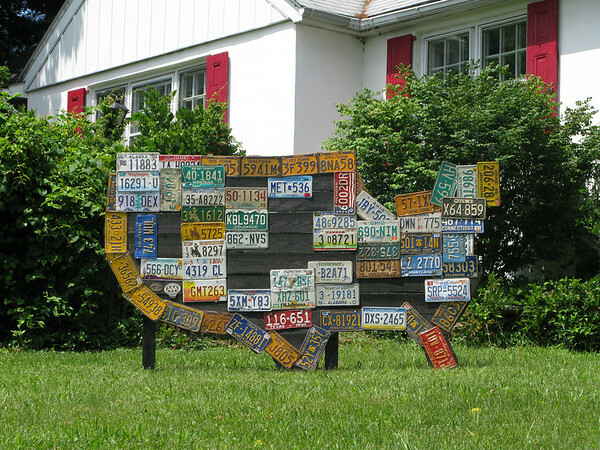 Shortly after crossing bridge number 10, I stopped to take a peek at a terrific yard art specimen. While stopped to snap my picture, a lithe gentleman who had to be every bit of 70 stopped his bicycle next to us to have a quick chat. He told us about the bridge that we’d just passed through and how it was made of African wood that was non-flammable. 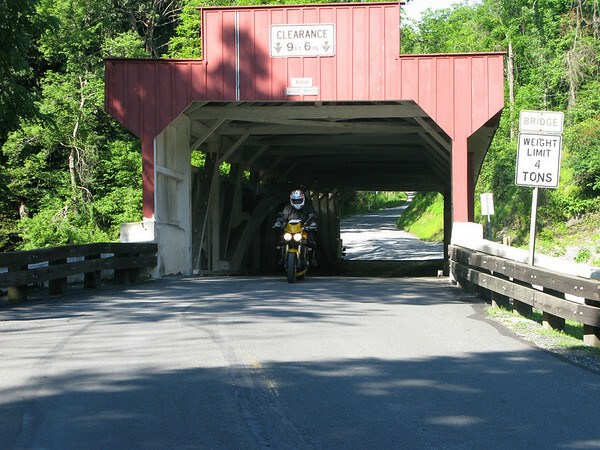 He asked where we were from, talked about his days of riding motorcycles and about Pennsylvania. He was sweet, warm and charming. We were lucky to have crossed path with such a friendly soul. As the miles ticked on under the bright blue sky, the feeling of freedom that seems to find its way in to my skin while I am riding, made itself at home. 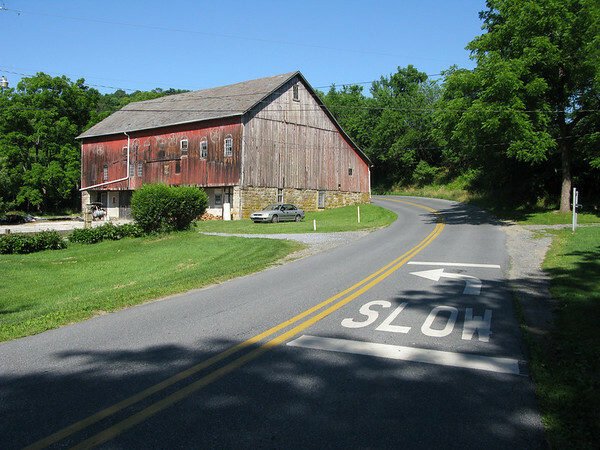 We rolled along the Pennsylvania farmlands through tarmac canyons that cut across cornfields. Their emerald green stalks stood waving high above our heads as we fluttered down the road, unfettered from real life and it made me feel like a million bucks. As our day’s ride drew to a close, though we would be staying in a nearby hotel, Kenny and I ventured off to the campground for dinner and to check out the entertainment for the evening. Being a registered attendee entered you into the running for door prizes and awards. I’ve said it before and I’ll stand by it, I am indeed a lucky girl. I walked away with a magnetic tank bag that promptly went on to the BMW that evening. Kenny had lady luck on his side as well and took home a Roadgear digital tire gauge. More than anything perhaps due to my shyness, people watching is hands down my favorite activity at events such as this. Within the motorcycling set there is no shortage of observable entertainment. There are the weekend ‘bikers’, the BMW farkle nerds, crazy dirt guys, hooligan sportbike riders and of course the average unclassifiable Joe who just happens to ride a motorcycle. But its the aforementioned kooks that I love to watch the most. Now that I think about it, I wonder which set I belong to? Having gotten up at 4:30 in the morning and now with a barbeque chicken dinner in our bellies and nearly 400 miles of traveling under our belt for the day, we’d both started to run out of gas by about 8:45. We’d decided to pack it in and head back to the hotel. Before leaving we had the good fortune of meeting Ben (Hi Ben!) who stops in to fuzzygalore.com often to say ‘Hello.’ It’s a small world and I’m happy to say that I’ve met some fine people along the way. Sunday morning burned through the curtains waking me at nearly 6:00. On deck for the day would be more rambling roads through the countryside. The second leg of our route would take us along streams, up over mountains and across wriggling sidewinders that crossed valleys all under another bright blue sky. I could hardly wait to get back out there and do it again. 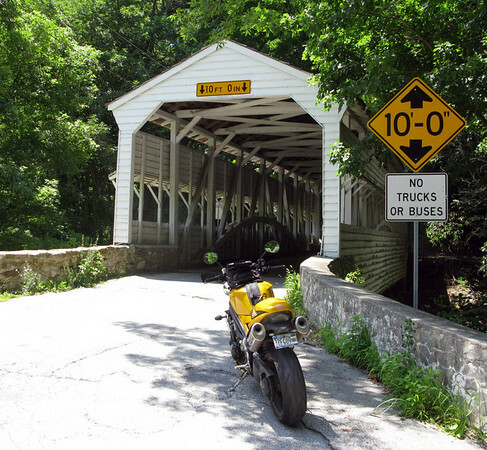 The Ramapo 500 was a well planned out, fun event that was suitable for all types of riders. I’m looking forward to 2010. The Amish statues are even creepier up close, no? Anyone thinking about/doing the Ramapo 500 this year? Had a great time last year. http://ow.ly/1wdl3 Thinking about doing it again.